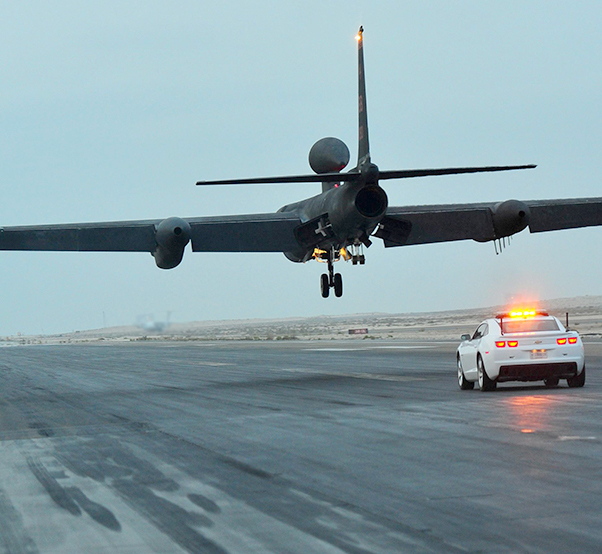 A U-2S reconnaissance aircraft comes in for a landing at an undisclosed location in Southwest Asia, Dec. 22, 2015. Upon landing, pilots must balance the aircraft’s unsupported 105-foot wingspan while bringing the aircraft to a halt. 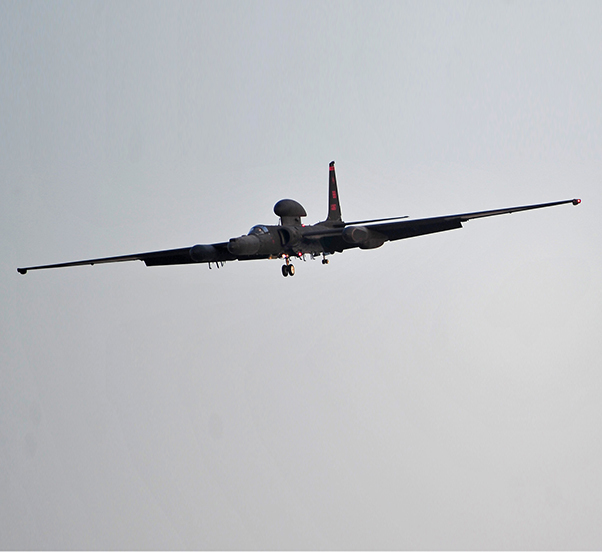 Despite the variety of manned and unmanned aircraft that have been proposed to take over the U-2S ISR role in the 60 years since its activation, it still remains a primary reconnaissance aircraft for the Air Force because of the men and women at the controls. The preflight preparations for a U-2S pilot starts the night before with dinner and a good night’s rest. Once at the squadron, pilots begin the process of suiting up before stepping out to fly what is known as the most difficult aircraft to land in the Air Force. “Some days you’ll go up and she’ll be perfectly well-behaved and she’ll be just like dancing with a lady,” Jacob said. “It’s going to be smooth and everything just goes great and it’s the best flight of your life, but then there are those days when (she’s) not a lady, she is a dragon, and you’re just trying to hold on while she tries to kill you. “A lot of it has to do with visibility,” he said. Normally, when a pilot lands an aircraft they have what’s referred to as a “ground rush” in their peripheral vision. As they’re flying along, the ground and runway comes into their peripheral vision, signaling when they should prepare to land. For U-2S pilots, their peripheral vision is severely limited by the full-pressure suit helmets worn during their flights. The helmet’s vision impairment is similar to a diving mask, not allowing for spotting objects to the left, right, up or down — only straight ahead. “You can tell you’re on the runway, but you can’t tell how high off the runway you are and that’s where the mobile comes in,” Jacob said. SSgt. 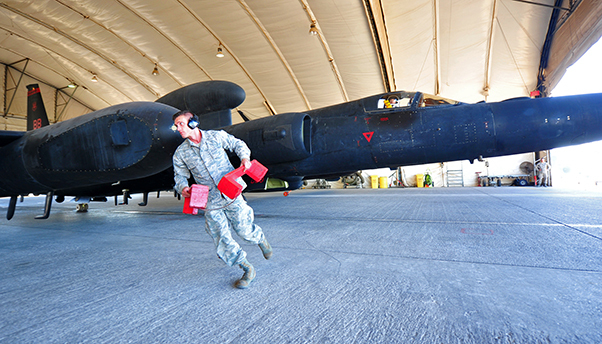 Sigfred, a U-2S reconnaissance aircraft maintainer, removes aircraft blocks prior to the departure of a U-2S at an undisclosed location in Southwest Asia, Dec. 10, 2015. Despite the variety of manned and unmanned aircraft that have been proposed to take over the aircraft’s intelligence, surveillance and reconnaissance role in the 60 years since its activation, it still remains a primary reconnaissance aircraft for the Air Force. Mobile chase car drivers act as a second pair of eyes and ears for U-2 pilots during their launch and landings, making up for the pilot’s limited movement and vision. Once an aircraft nears the runway, chase cars speed off in pursuit close behind it, radioing adjustments to pilot until they are inches from the ground. Upon landing, pilots attempt to balance the aircraft’s 105-foot wingspan while slowing it down to a halt. It can be difficult because the aircraft’s landing gear set is similar to a bicycle’s, with no support for its long wings, while most planes have three sets of landing gear, according to Jacob. 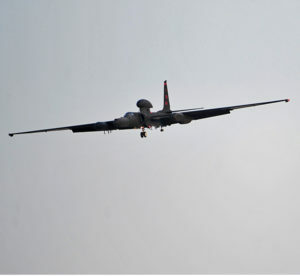 At any one time there are hundreds of people supporting U-2S operations, from the maintainers on the ground to the intelligence personnel who analyze the information, which is gathered and disseminated by U-2S pilots during combat sorties, Stephen said. U-2S pilots also clarified what is the most difficult challenge they face when piloting the aircraft. The average length of a U-2S pilot’s combat sortie is approximately 10 hours, thousands of feet above the Earth, and with pilots unable to move more than an inch up or down in their seat, without hitting their head on the canopy. The uncomfortable solo flights are something potential U-2S pilots must mentally be ready to encounter, Jacob said. 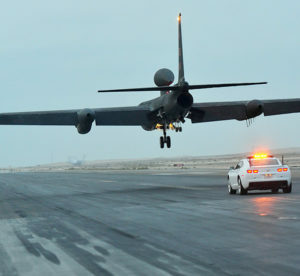 A mobile chase car driver pursues a U-2S reconnaissance aircraft during its landing at an undisclosed location in Southwest Asia, Dec. 7, 2015. Mobile chase car drivers act as a second pair of eyes and ears for U-2S pilots during their launch and landings, radioing adjustments to the aircraft to make up for the pilot’s limited sight of the runway. 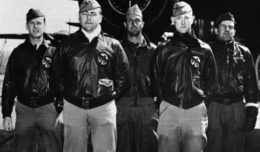 Despite flying solo for up to 10 hours and attempting to land, tired and hungry with limited visibility, Jacob and other pilots of the 99th ERS said they wouldn’t trade the experience for anything in the world. Editor’s note: Last names were removed due to security and operational concerns.